The Princeton Architectural Press recently published a book about the 19th-century ornamental design phenomenon of “artistic printing”. 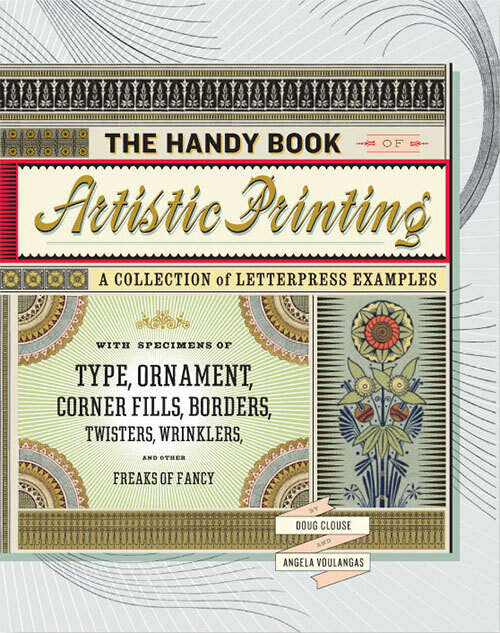 In the spirit of typical Victorian excess, the book’s full title is appropriately verbose: The Handy Book of Artistic Printing: A Collection of Letterpress Examples with Specimens of Type, Ornament, Corner Fills, Borders, Twisters, Wrinklers, and other Freaks of Fancy . The book was authored by Doug Clouse and Angela Voulangas — both designers in New York City who met as fellow employees “within the venerable halls of The New York Public Library on Fifth Avenue, New York City”. Doug Clouse is also the author of Mackellar, Smiths & Jordan: Typographic Tastemakers of the Late Nineteenth Century , published last year by Oak Knoll Press. More info can be found on the book’s official site; I also highly recommend subscribing to the new Artistic Printing blog, maintained by Clouse and Voulangas, dealing with related topics. Voulangas also publishes the Parenthetically blog, with notes on art, ornament, ephemera, etc.